I’ve not got much more to say – but I will note that we’ll be opening a bottle of something fizzy tonight! What’s that in blue whales? That would only be 12.4% of a blue whale according to the FAQ’s (45 grams per pi) and Wikipedia (200 short tons per blue whale). What’s that in Nelson’s Columns? And in area, 500,000 Pis = 112.9 nanoWales. That’s not bad stats is it. My second Pi should arrive today. wife has become a bit attached to he first which is getting used a s a media server. need another one to play with. Looking forward to 29th Feb 2016 – that will be my 12th birthday! Congratulations on the 500K milestone, absolutely amazing. 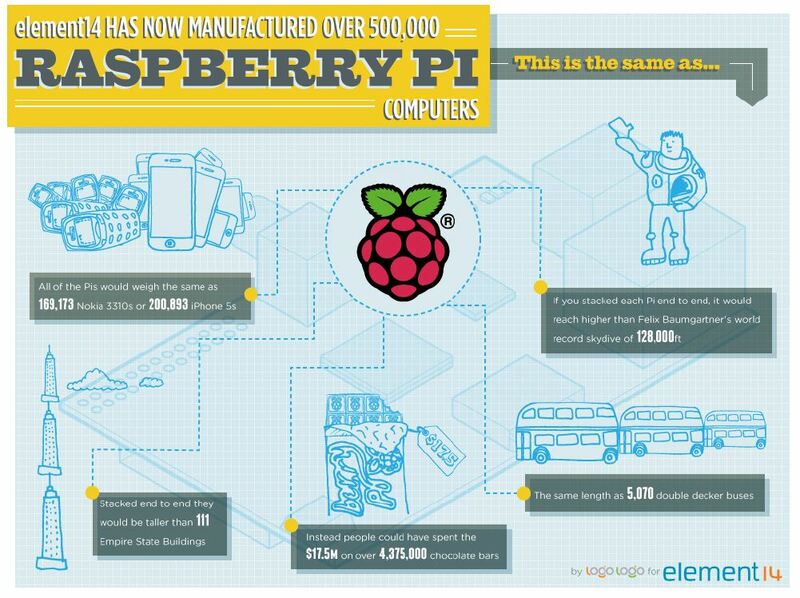 The Raspberry Pi nails it on all fronts: education, nostalgia (reminds me of my Amiga 1200… and my Speccy 48+). It’s full of “ility” as well: learnability, usability, practicality, funability. Excellent. Now let’s bring on the Rev A’s and watch them sell 3 million! I love the way so many of the projects we see are things than would never have occurred to us at the Foundation in a million years. The water droplets from the other day, and the project I’m planning on writing about tomorrow, are both excellent examples – things which are relatively simple but still beautifully imaginative. I seriously doubt that RS has sold that many. I ordered two pi’s around june/july and all subsequent ones were ordered from Farnell because I was still waiting for the RS one. From the order number schedule published they took care of the backlog at about twice the pace that Farnell had been selling all along for months already. From the order numbers I cannot accurately guess how many ‘PIs they sold, as one order number may be fore more than one ‘pi, but on the other hand, in the months in between some people may have cancelled their order…. There have been some fascinating things done with this little board. Now, let’s see what the kids do with them. I’ve just heard that a really nice guy has donated a classroom’s worth of RPis to my son’s school. I can’t wait to see what they do with them. Publicity and success well deserved. Brilliant job, guys. Keep up the great work! Bravo! I have one of them deployed to support my 24/7 ham radio DSTAR hotspot. Works like a charm! I love Raspberry Pi, I bought mine at alllied.com ! I love Raspberry Pi, I bought mine at allied.com ! Well done !! All credit to Eben, Liz, all at the foundation, and everyone who has made the concept, design, manufacture and delivery a huge success. Are Farnell and RS managing to hold stock or does stock disappear instantly? Are they sure the current production rate is not causing a bottleneck? Looking around the place, it appears that ‘developers’ are buying multiple units and the target audience has not really started to bulk buy yet. The rate of requests for the Raspberry Pi will probably spike again with the educational release and mass use within ICT curricula. It could be that we’ve got to a point where people won’t order unless they’re in stock, which means you get a kind of bumpy equilibrium. We’ve seen evidence that they are out of stock some of the time, but I don’t believe we’re in a proper backlog situation – but it’s impossible to say whether this means it’s the bumpy equilibrium I mention above, or whether it’s because we’re broadly on top of demand. I can tell you that multi-orders (of the sort that schools etc. make) do get fulfilled very quickly now. Yes, I’ve had the impression that Farnell has been in the “they are ordered the moment they are in stock”. for a while. 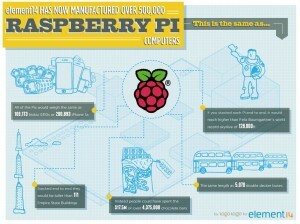 They tweeted: Raspberry pi now in stock! yesterday. But the Dutch site still says “19 days leadtime”. it’s been saying that for months, but I kept getting my ‘pi in a day or two. Now that they claim “in stock” I tweeted back to them and they responded that IT would look into it because it wasn’t right. Can you ask around at Broadcom to find and old timer who knows how many BBC Micros and Archimedes were sold? Wikipedia says >1.5 million BBCs. The RPi will eclipse that soon and I suppose it has already sold more than the Arcs? Nobody we know will know those numbers, I’m afraid (unless Jason and the guys at the Centre for Computing History have any idea) – but we’re pretty sure we went past the Archimedes quite a while ago. Those things were expensive. Congratulations! Producing, much less selling, half a million of anything is nothing to sneeze at (especially if it’s powered up and not in a case :) ) and the total number probably being closer to a million already is even more impressive. While there has been a strong, passionate customer base made up primarily of self-motivated (and often experienced) individuals, it’s not clear how the Model A will fare since it is aimed more at the originally-intended audience of primary/secondary school students. The feedback I’m getting from educators, who aren’t experienced with technology at the level needed to successfully deploy a lot of Pi units through entire school systems, is that they’re not ready to leap because there is no unified package of everything needed (yet?). They don’t have time to perform the integration themselves, and that effort has to be repeated by each educator, or at best by each school or district, which is grossly ineffective. Educational institutions (or any other bureaucracy) don’t buy things in bulk the way that we buy things as tech-savvy individuals (big-box discount places like Costco, Sam’s Club, BJ’s, etc., notwithstanding). Choice is actually considered a bad thing because it means more limited opportunities for volume discounts, and there is a huge amount of choice just in terms of peripherals required for the Pi (power supplies, keyboards, pointing devices, cables, displays, cases, etc.). Then, there are the optional peripherals such as the GertBoard, Adafruit interfaces, Arduino boards, etc., which each tend to be more expensive than the Pi board. Just as important are the education-oriented training materials for teachers who don’t feel comfortable being unprepared for the plethora of inevitable student questions that they can’t answer immediately. Less adventurous educators want more predictable structure, even though there is a lot of evidence (and common sense) that getting students curious enough to answer their own questions is a key to establishing a lifetime of learning. If they aren’t lucky enough to have a local expert, many teachers are certainly not going to want to rely on posting questions to forums and mostly getting replies that are way over their heads in geek-speak. There just aren’t enough people with the right tech experience who can also communicate effectively with educators in their parlance. Institutions only deal with vendors who can (or at least purport to) provide end-to-end “solutions”, and they have historically just been fronts for Microsoft, Apple, and their business partners, so they have a vested interest in maintaining the status quo. While it may not seem logical, even a million Pi units is a drop in the bucket to these vendors – there are billions of children of school age around the world, although “only” a few hundred million of them are in what most of us would recognize as schools. It’s going to take time for businesses to figure out how to put together all of the parts in well-integrated packages and at least cover all of their costs, if they’re willing to constrain their profits. That may only be possible if non-profit entities are able to take up the challenge, but their budgets typically don’t allow for quick growth and widespread coverage precisely because of their inability to raise capital, which typically requires a profit being generated. Chicken, meet Egg. Egg, meet Chicken. Until there is one, or at most no more than a few, packages of everything needed to get things up and running in classrooms (including the teacher-oriented materials), the fielding of the Pi by the millions in schools is probably not going to happen over the next year, or so. I will be extremely happy to be proven wrong, but if not, I hope that this problem is being addressed. I can’t wait for 8,000,000,000. By that time, you could almost guarantee that every human on earth has one, and may be able to learn computer programming. If you sold them at the ratio of Mod As and Mod Bs you’re expecting, how much money would that take? If the selling rate doesn’t slow down before then, how long would it take for you to reach that number? Who is behind http://www.raspberrypi.com.tw/ ? I think it is backed up by element14, not sure. Is Raspberry Pi Foundation related to it? There is an element14 logo on that page, so it should be Farnell/element14. The foundation chose Farnell/element14 and RS because of their familarity with international sales. It’s difficult to sell millions of products into each individual country. Sometimes it pays to set up a local company that imports from the main company and sells to the local customers.Farnell already has that infrastructure. Anyway, thanks a lot for the Pi ! it’s one nice piece of thinkering, educationnal, linux learning, etc. Would be nice to make a real big supercomputer out of all these raspberries. Yeah, good luck with getting stats from RS… If they’re nearly as fast as delivering the product, try again in 3 months. Seriously though, congratulations. A million is a serious number. It’s a success well deserved. I’m constantly amazed at what this little thing can do. You should celebrate accordingly! One million raspberry pi end to end is 137+ 1 EAR times longer than the Harvard Bridge. Although, I have to ask. What percentage of those ever actually made it into schools? It’s kids rather than schools that we think are important (for a lot of people, learning at home and on your own schedule works better); we think that about 20% of them (that’s a LOT of units) are in the hands of kids. I can account for 20 of them, to be used in an upper level undergraduate class on compiler construction at the U of Iowa this spring. It’s not the intended audience, but they are going into student hands in a classroom. We also got the university’s electronics shop to stock the Pi on a retail basis, so students can buy their own if they want. upper level undergraduate class on compiler construction at the U of Iowa this spring. As the actual workstations, or as X terminals to a host? 1) Easier to manage/patch/upgrade one machine than 20. It’ll work just fine as the workstation for development — that’s why I bought 20 of them, but the real reason to use the Pi is as a target. The Intel architecture is thoroughly disgusting as the target architecture for a compiler construction course. Writing compilers for a RISC machine like the ARM is a far better exercise for students who are just beginning. Of course, I could have them write compilers whose output is run on an emulator — there are good ARM emulators that run under Linux and that other operating system, but there’s more motivation in generating code for a real machine. So, we’ve put together 20 Raspberry kits (a Pi in an enclosure with power supply brick, plus a paintbox that just holds the lot) as loaners to students, with some Pi-oriented workstations in the on-campus lab (monitor + keyboard + mouse + network cable — bring your own Pi). We expect students to buy their own SD cards, so as a side benefit, they’ll be their own sysadmins. Why the uncertainty about numbers? Can’t you just count the royalties the Foundation has received from sales? That’s not how it works – we get royalties and figures every few months, not every time someone buys a Pi! Congrats.. i’ve buyed myself like 5 for a friends in el salvador. I have one in productión for surveliance in my home but i pretende using it for teaching. Thank you guys for your effort. Please skip the ARMv7 architecture and jump straight to ARMv8 with a Cortex A53-based (maybe dual core?) Raspberry Pi 2.0. No need to make developers support 3 different architectures (ARMv6, ARMv7 and ARMv8). Also introduce a GPU that supports OpenGL ES 3.0 in the next version.